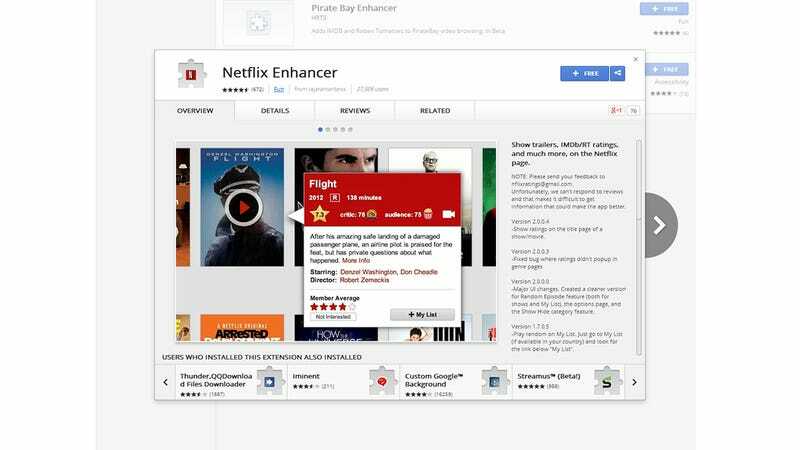 Netflix Enhancer is a very useful extension for Chrome browsers that adds some bells and whistles to your Netflix experience. Install the tool from the Chrome Web Store, and a small N icon appears in the browser address bar whenever you're on the Netflix site. Hover over any of the titles on Netflix and the pop-up box will now include ratings from IMDB and Rotten Tomatoes, if available. If Netflix Enhancer is able to find a trailer for the movie you've selected, you'll see a small white camera icon; click on this to see the trailer and get help deciding whether you really do want to sit through the film in question. There's more! You can show or hide any of the rows on the front page of Netflix (if documentaries really aren't your thing perhaps) and whenever you view the title page of a TV series you'll see a new Random Episode button; handy when you just can't choose between Season 3 and Season 4. Any of these options can be enabled or disabled by clicking on the extension's icon and following the link to the options page.